Are you looking for vintage bamboo furniture for outdoor such as tables, chairs, stools, cabinets or bedroom made by famous factory, supplier, manufacturer and exporter with creativity handmade goods?. We can give you natural large bamboo, is all-natural, unique and very strong quality, and also we can make custom bamboo furniture composed of different types of bamboo from Indonesia Furniture Factory like us with various colors. An immense pleasure for outdoor furniture is highly durable a largest collection of rattan and bamboo furniture the rustic collections includes bamboo beds, dressers, tables, chairs with various design, simply knock down construction, offer the finest in upscale available. According to wikipedia, Bamboo is a type of grass plants with hollow and segment in the trunk. Bamboo has many types. Other names of bamboo are reed, aur, and eru. In this world bamboo is one of the fastest growing plants. Because it has a unique rhizome-dependent system, in a day the bamboo can grow as long as 60 cm (24 inches) even more, depending on the soil conditions and the climatology where it is planted. 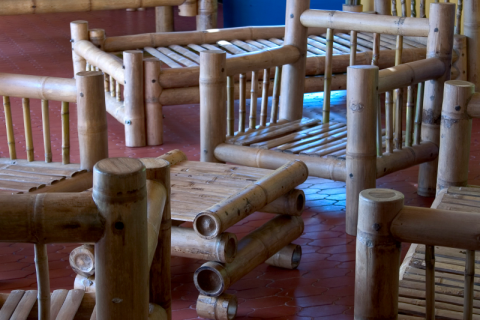 Indonesian Bamboo Furniture Manufacturers and Suppliers can last for years, a timeless and essential and both durable for indoors and outdoors, varieties of tropical style and exotic choices. A lot of innovative of the products which hand made locally in Yogyakarta, Indonesia lovingly crafting collection provides quality bamboo furniture handcrafted in an entire line is beautiful and built to last. A growing variety, available in a range of great colors, a perfect creation for relaxed living environment, such as bamboo bedroom furniture for outdoor patio, or poolside. Our High Quality Bamboo Furniture is designed to enhance the beauty and comfort, graceful lines while providing a sturdy base, an ideal to complement the garden, patio, outdoor or indoor usage. A unique and innovative design from one of the most versatile building materials, flexibility selection to suit any design and decoration plans. An eco-friendly masterpiece raw material products will last until the future with it is durability,beauty, chic and airy, a great option with attractive design, and also application of traditional craft with custom made bamboo furniture available. How to Order Indonesian Bamboo Furniture? Introduce Us, Yanis Gallery is a Business to Business (B2B) handicraft company in Indonesia. We established in 1978 and already have a lot of experience in the field of handicrafts. To order Indonesian bamboo furniture such as tables, chairs, cabinet, stools or bedroom , please email us at [email protected]. We will gladly answer and fulfill your bamboo furniture request. © 2019 Yani's Gallery. All Rights Reserved.